Everyone should be aware of my fascination with Brashares' previous novel, My Name is Memory. Full disclosure: I didn't read The Traveling Pants series. I only know Brashares for that one heart-wrenching, mind-melding, haunt-me-for-weeks novel. When I received the invitation to read the ARC for The Here and Now, I was all over it. First thing's first. Quick synopsis. 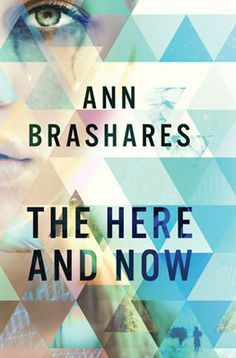 The Here and Now is about Prenna, a young girl from a plagued-ridden future who emigrates to 2010 with a colony of survivors. They are free and safe in the present-day world, but are forced to live by a certain set of strict rules, to include forbidden relations with time natives. Well of course, charming and adorable Ethan enters the picture. Then, a cool mystery involving a death to be prevented and a world to save. Insta-conflict. The Here and Now is quick paced. Not in the action sense but in the "cut straight to the chase" sense. It's not as epic and drawn out as the other Brashares novel I read, but I'll stop the comparing here (maybe). It didn't take me long to get into the novel or feel attached to the characters, especially Ethan. There was not a lot of complicated world-building or background. The story begins on page one, and I loved that. It was un-put-down-able. If you are a time-travel fan, as am I, you will love this fresh perspective. This time-travel takes place in the past (future? ), and the novel is really about the consequences of their travel. They, of course, try to stop things that haven't happened yet and avoid things that never happen from happening, and it has that always-lovable mind-twist ingredient of the genre. If I had any complaint about this book, it's that I want more. I want the story to be a bit deeper and a bit longer. And I want our dear friend Ann to try to write an ending that doesn't leave her readers from shaking, weeping and screaming. Too much to ask? This sounds really cool!! I enjoyed My Name is Memory, though the ending left me desiring more of a conclusion. I felt the same way when I ended it! I just wanted *more*. Her idea is so brilliant here, and so *possible* that I would totally read more to this series. I just love her, seriously. Whatta writer!